Professor Uduogie Ivowi is the immediate past president of the Nigerian Academy of Education and former Executive Secretary of the National Educational Research and Development Council (NERDC). He is a retired professor of science education at the University of Lagos. In this interview with ABDUSSALAM AMOO, the widely travelled and experienced scholar popularly known as UMO Ivowi gives an overview of the Nigerian education sector and proffers solutions to that. What is your general evaluation of the Nigerian education sector? Generally, the Nigerian education sector is not in a healthy situation. We have very many good policies but our major problem is the implementation of these policies. This has led to a lot of comments on the Nigerian education sector. Some people see it as deteriorating, others see it as not improving at all just as others see it as a stumbling block to the nation’s development. They are all correct. First, we need a very strong political will for things to move forward. As I said earlier, we have good policies. It is just for a government to decide to implement the policies. If that political will is strong, there would be funding. We already have a good number of personnel. We need to do more training for them. Possibly, within a space of four to five years, we would see highly noticeable improvement. What could have accounted for the poor performance of majority of candidates in public examinations in recent times? It is not surprising at all. First, the teaching and learning that goes on in schools is far below standard. You go to secondary schools and see that many teachers are not motivated. Many of them are traders looking for other means of survival. Their salaries are not paid as at when due. Also, the school authority does not motivate them to teach. I remember in my days teaching, we used to organise extra classes for our students at no extra pay just because we want these children to perform well. If you go to schools now, you’ll find out that for the sciences, many of them don’t do practical. You ask the school authority and they complain of lack of funds, or equipment. Most of the things done in class are theoretically-based, which shouldn’t be. We have developed curricular that should enable teaching and learning to go functionally. The curriculum has been so developed that there are no materials to teach some of its specifications. On the motivation, teachers are not empowered to teach properly. You will want to do practical but the lack of funds and equipment are there to battle with. Even when you consider improvisation, there is no little money to take care of that. When you want to do extra lessons too, there is little or no support from the school authority. Therefore, there is a shortfall in the learning process. Once this happens, there would be a shortfall in what the students acquire. When we give them exam based on the curriculum based on the notion that all the things in the curriculum were taught, they will not pass well. So, I’m not surprised that they don’t pass well. If you want to use foreign curriculum for your own school, go and establish it elsewhere, where it could be permitted. It shouldn’t be in Nigeria. The TRCN had at various times threatened to jail or sanction school owners for employing unqualified teachers. Is it that willpower that is affecting the TRCN from implementing such? The TRCN has a very big problem, which is common everywhere in Nigeria. It is a requirement that we must have teachers to teach. This thing has gone on for so many years. In developed countries, if you are not licenced to teach, you cannot teach. If you teach, you are an intruder and the person that employs you has committed a criminal offence, like you too and that is to be dealt with. But in Nigeria, all sorts of things are happening. First, many teachers are not qualified to teach based on registration with TRCN licence. These people just find themselves in the classroom because they have nothing to do. When they’re there, instead of teaching, they are cheating. So, they are not there to do their best because it is a stop by. They’re looking for other jobs. Once they get other jobs, they leave teaching. Like in other professions, you cannot practice unless you are licenced to practice. Talk of accountancy, law, or medicine, only those licenced get to practice. But talk of teaching, those who are not even qualified go to the class and teach. So, the person who employed them has committed an offence just like the employee too. So, you find that TRCN has a big problem. They cannot do the enforcement on their own. They have to use other government agencies. Even to enforce it would create all sorts of problem here. Classrooms would be empty and that would create more problems. It is a big problem but it has to be solved. Then, there are still many qualified teachers who have refused to register with the TRCN. Such people, for instance, should be thrown out for refusing to register for no just cause. No lawyer, engineer or doctor would refuse to register. So, why should a teacher refuse to register? The TRCN should do something about that. If I were the president of this country, it would be an offence for you to use foreign curriculum. You cannot go there and establish a school in the US and say because you are a Nigerian, you are going to use the Nigerian curriculum. Most times candidates are admitted into colleges or faculties of education, they are usually low scorers. Isn’t that a problem itself? Of course, they are low scorers. But what the National Policy on Education emphasises is interest and ability. If your interest is to teach or be in the teaching profession despite being a low scorer in the academic, you can manage to get to a certain point. The teachers in the colleges of education or universities are professionals. They know what to do to teach you well to be a good teacher. It is said that there is nothing that cannot be taught to a willing heart. You can learn anything at any time provided that you are given a qualified person to teach you and there is sufficient time for you to be taught. Interestingly, if you have a curriculum, you are not expected to know everything in it. You are to be taught is such a way that you will know many of the things there at a level that is acceptable. The others are details you may not necessarily come across in life. Have the basic concept, know the basic application, then, you are on for life. You already said the Nigerian curriculum is fine. But some schools adopt curricular other than that. Does that mean that other curricular are superior to that of Nigeria? I’m against that. If I were the president of this country, it would be an offence for you to use foreign curriculum. You cannot go and establish a school in the US and say because you are a Nigerian, you are going to use the Nigerian curriculum. No way! You cannot go to Britain and say that because you are an American, you will use American curriculum for secondary school. You can’t try that in Germany either. Our people not patriotic. A Nigerian here sits down and says he wants to use British curriculum. For what? I’m against that. It is very wrong. Our children in the so called private schools would say they do Nigerian curriculum too. Some, may be, don’t even want to do Nigerian public exams at all because their parents are so rich that they know when they finish, they would send them overseas. They do the French Baccalaureate exam or the British exam. So, by the time they finish, they either go to Britain or France. Of course, their parents would sponsor them. They ignore the Nigerian curriculum and that is not good enough. It shouldn’t be allowed or done. We have developed curricular that should enable teaching and learning to go functionally. The curriculum has been so developed that there are no materials to teach some of its specifications. Our curriculum is as good as other curricular in the world. I am speaking from both academic and professional standpoint. The problem with our curriculum is that we are not implementing it the way it should be implemented. Go to Britain or France, you’d see the way they implement their curricular. You go to a school and the necessary facilities are available. But come to Nigeria, the things that you need to teach are not available. Many years ago when I used to teach at a particular university, we used physics labs where the drawers contain materials to use for experiments. So, a child can come at any time he is free to look at the experiment he couldn’t finish or didn’t do very well. The lab attendants are there to attend to you. Less than five years after, still many years ago, the same lab and the drawer became filled with cockroaches or some other rubbish. You find no material to do any experiment. That showed the level that that lab had degenerated into and you want me to believe that the students you will produce from that type of chaotic situation would be the same as the students you produced years ago? They cannot be the same. That’s the situation we are today. I must also say that there are many students in Nigeria today, who when they go for the Senior School Certificate Examination (SSCE), it is most likely that it is at the exam they would be seeing or using some of the equipment for the first time. It was not the case many years ago when WAEC used to recognise schools for science. You must have equipment and it used to be that by the time the exam is coming, WAEC would send a list of equipment that would be used for the practical. That would give room for early preparation ahead so that students familiar with the use of relevant equipment can get to use them on their own when the exam comes. But today, some schools are in ‘paradise’, others are in ‘hell’ with regard to equipment. If you want to use foreign curriculum for your own school, go and establish it elsewhere, where it could be permitted. It shouldn’t be in Nigeria. It is true that you have a right to give yourself whatever name you want. You go a buka (restaurant) they call an international hotel. You cannot sue the man for committing an offence but it is still a mama put. If you like it, you go there irrespective of the name. But when it comes to something that government controls, we should do things more orderly. The national policy on education talks of secondary education. We have junior secondary schools and senior secondary schools. In America, they don’t talk of junior secondary schools but junior high schools. 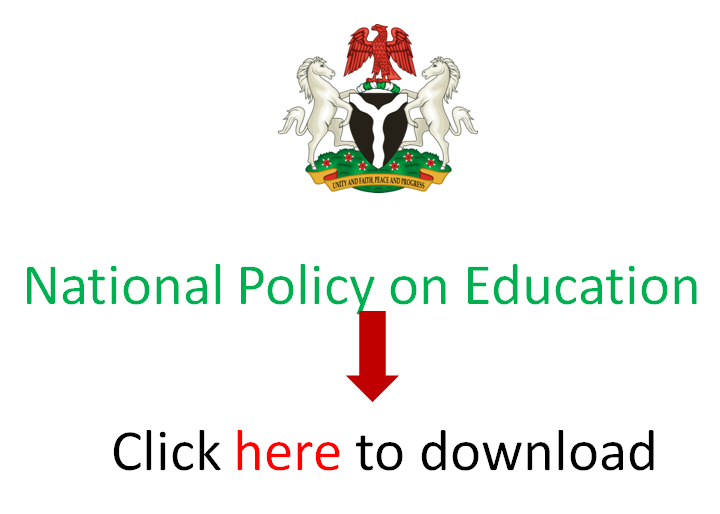 The new edition of the National Policy on Education (for instance) has not been published when it should. Don’t you think that is a reason why people prefer foreign policies? That cannot be a problem. The universally accepted routine is that you update your curriculum and revise it every five years. So, if our National Policy on Education is revised every five years, or even ten years, it is okay. However, if there is an emergency that calls for revision of education policy or revision of the curriculum, it can always be done. But at the moment, the last revision done in 2013 is not bad. That’s okay. But as I said, the problem is not with its revision but with its implementation. If we religiously implement what is in the policy, we would see much improvement in our education sector. Part of the policy says that the language of the environment should be used to teach pupils in the early years. How could that be effective in the face of loss in translation especially for scientific terms? There is no problem with that. About twenty years ago, the NERDC organised and developed scientific concepts and terms in the various Nigerian languages. We first of all did for the three Nigerian languages and later increased it to nine of them. A language develops by borrowing from other languages. Therefore, as far as scientific terms are concerned, we have developed that in nine Nigerian languages, including my own language Etsako, to be able to teach science in those languages. There is no problem with that at all. It is true that the policy says you should teach using the language of the immediate environment from primaries 1 to 3 and you can now continue with the three national languages as part of the curriculum apart from English and French. Studying one major Nigerian language other than their mother tongue is to ensure unity in the country so that if you are a Yoruba, you probably would learn Hausa or Igbo. If you are Igbo, you will learn Hausa or Yoruba. And if you are Hausa, you will learn Yoruba or Igbo. The result is that as a Yoruba person, if you go outside, you would see with whom you can talk in either Yoruba or Igbo or Hausa. Yes, it is not something you could do overnight. It started but we did not take it as seriously as it should be. It is part of why I said the problem has to do with implementation. It’s a government policy and experts sat down and made a plan on how to implement it but we have not been doing well in that direction. It is something that can be done. There is no problem in it. After all, the first set of people to learn French in Nigeria started from the universities. They never learnt it prior to then. But now, people do that in secondary schools. So, it is gradual process. There is research evidence that children can learn eight languages without confusion. We are told that in Sweden, every child is proficient in up to five languages i.e. both speaking and writing. So, language is not a difficult problem that cannot be surmounted. Through the NERDC, we have developed autography in up to 30 Nigerian languages, at the last count. You will find that we have a rich reservoir of information about Nigerian languages. Autography is the first stage. How have the Nigerian Academy of Education and the Curriculum Organisation of Nigeria been upholding standards in teacher education in Nigeria? *Later in the year, the Curriculum Organisation of Nigeria is organising a conference to address the incidences of foreign curriculum being run in Nigeria. At the Curriculum Organisation of Nigeria, we run conferences with varying themes for teachers across all levels of education. Most people do curriculum theoretically. But we try to show the practical side of curriculum – how to develop and design a curriculum, the things you need and how it should be done properly. So, we interact and our members come. They give their own experience. They write papers, which are discussed and so, we are promoting better use of the curriculum. We are also promoting better design and development of curriculum. The Nigerian Academy of Education is one of the five academies that the Federal Government has approved. We have the Academies of Science, Engineering, Letters, Education and Pharmacy. They all hold annual conferences and make their own input in professional development of their members. We do the same thing at the Academy of Education and we don’t have sufficient money. We have approached government for grants to be given to these bodies. That is done in developed countries. During the time of Obasanjo as president, there was an attempt to do something for us but that was scuttled. We had asked for one of the abandoned government property in Lagos, the former National Assembly at the Tafawa Balewa Square (Lagos) to be given to the Academies. With the little money given to us, we would now be able to maintain it and have a secretariat there. Academies should be organising conferences, symposia, workshops, and challenging each member to make research and develop learning and teaching. But unfortunately, as far as we went, we didn’t get anything in the end. The matter is still there unresolved. Individual academies have been playing their roles. In the Academy of Engineering, for instance, their members are endowed. They have companies. So, they are able to get money. The Academy of Science gets support from the Ministry of Science and Technology. But for the Academy of Education, the Federal Ministry of Education has not been doing what it ought to do. They don’t give us money with the claim that once they give money to the Academy of Education, there are many other professional bodies in education. So, if they give to one, they must give to the rest. Many years ago, they used to give money to associations that register, however little. I remember that at the Science Teachers’ Association of Nigeria when we were last told to come and get money, we discovered that the cost of travelling between our then Ibadan secretariat and Lagos (which was then the capital) to and fro was a substantial part of the money. Despite that, the Nigerian Academy of Education is trying its best but like other Academies, we don’t have any money. There are many things we want to do that we are unable to do. Last time, we were lucky to get N10 million from one of the governors and we embarked on a book development project. We were able to get our members to write books, which would be used by colleges of education and university undergraduates. Five books were published through that of the supposed seven. The sixth one is still in press. So, we had to pay those who did the writing and from the sale, we were able to get a little to manage. The seventh did not go to press at all. The Academy is trying to do things properly. *We have a plan to run the West African Education Summit. That is the main thing the Academy is trying to do now. We are still soliciting for funds from education parastatals and the ministry of education. I am just the immediate past president. I’m in touch with the current president and I know the effort they are making but it has not yielded the desired result yet. *Note: This interview was granted in March, 2018. Some part had earlier been published in a news report where Professor UMO Ivowi condemned the multiplicity of exams written in Nigeria calling for the scrapping of the Unified Tertiary Matriculation Examination (UTME). Click here to read about that. The late publication of this interview in full is however regretted.